As some of you may know, I take the month of August off each year to reconnect with all of the things that I let go during the prior five months. Projects, friends, family…..my garden. I do the same thing in December, and so far, it is working out pretty well. This has been a particularly busy—-crazy, really!—time since we rang in 2012, and most of it has been spent in book preparation, including manuscript completion, page proof editing, book cover design, interior layout design and all of the other little things that go into writing and publishing a book. Then there is the PR and the marketing, and fortunately I have some excellent help in those categories. I have been giving interviews, writing guest pieces, speaking at conferences and touching base with lots of people who care about the issues addressed by Best Friends at the Bar. Tomorrow I am sitting down with Reuters to contribute to a piece about the changing legal profession, and later this week I am off to Chicago to speak at a law firm and at the National Conference of Womens Bar Associations Leadership Summit. Can’t forget the Book Launch Event that is being hosted by Georgetown Law on September 27th. This is going to be a great event, and it is being co-partnered by the Global Women’s Innovation Network (Global WIN). We are in the final stages of negotiations with a women’s magazine as another co-partner, and that will bring lots of additional buzz and excitement to the event. Law firms also are very supportive about sponsoring these events, so keep that in mind for your firm. The benefits of sponsorship go far beyond being supportive of women lawyers and include the opportunity to have me do a program at the firm. Let me know if you or your firm is interested in joining us at the event and sponsoring. As you can see, lots going on, and all of it good. The efforts of the last five months have paid off in a big way, and I love the new book. It is being very well-received and is a great compliment to the first book. I look forward to sharing it with many of you, especially those of you who will attend the Ms. JD Conference at American University Washington College of Law in October. I am looking forward to seeing many of you there. Here’s wishing you a wonderful end of summer! (Ugh, that is hard to think about. Where did it go?) For those of you off to college or law school next fall, enjoy yourselves and do something to renew your body and soul before the push begins again. For those of you who just wrote the bar exam, chill out for awhile and do something REALLY special to reward yourself. And, don’t replay that awful exam in your head every day. Give it up. Chances are that you did a lot better than your instant and continuous replay will lead you to believe. Most do. Thank you for following my blog, supporting Best Friends at the Bar, and buying the books. You will be doing yourself a favor by reading them! This is a pay-it-forward project, so tell a friend! The bar exam is a necessary evil. However, it is a two- month experience, and then it is over. There is summer left and fun and sun ahead of you. Stay the course. Here is my best advice to you. Try to get a good night’s sleep each night before the exam, and be confident. A positive attitude goes a long way. Do not second guess all of your answers and look back after the exam. First of all, it is hard to recall just exactly how the question was posed—especially on the multistate—and it will only erode your confidence. Over analyzing is rarely a good idea, and it is certainly not a good idea when you have to keep up your energy and spirit for the next day. Don’t discuss the exam with others who are taking it. Most of them will not give you a candid response about how they feel or how they think they are doing. They are trying to hide their fear just like you are. Try to do something that will relax you after the exam. Take a walk, get an ice cream cone, sit by the water. Take deep breaths and remember that you did well in law school and you know a lot of stuff. You worked hard to prepare for this exam, and your job is to give it your best shot. It is a marathon and not a sprint. Treat it like one. Clear your head, be steady, keep up the pace, and round that next corner with confidence. I am pulling for you! (NAWL) conference. As usual, it was a great success. The panels were very informative, and the panelists very impressive. I thought the panel “Rainmaking Uncovered: You’ve Got What It Takes, Now Learn How to Use It,” was extremely well done. It was all about gaining and retaining clients, and it could have been called “Making the Pitch.” I wish every young woman lawyer had the opportunity to attend this program. The moderators, both acquaintances of mine, did a fine job in creating a team approach for developing pitches, and the panelists comments and critiques were very valuable. The “Pipeline to Equity Partnership” panel was excellent. I particularly enjoyed the comments of panelist Andrea Kramer of McDermott Will & Emery, who always does an excellent job of hitting the nail on the head in these discussions. I also enjoyed “Women and Minorities: Willing Partners or Reluctant Allies?”, and it was a challenging discussion for everyone in the room. There is so much more to be said on this subject. The awards luncheon was a star-studded event. David Boies was in trial and unable to be there to receive his “Lead by Example” award, but his wife and law partner was very entertaining in making us more familiar with Mr. Boies. Retired Federal Judge Nancy Gertner regaled us with wonderful anecdotes and her special brand of candor and humor in accepting her award. My only regret about this conference and the NAWL conferences of years past is that there are not enough young women lawyers in attendance at the panels. Law firms that sponsor the awards luncheon send their young women lawyers to that part of the day to fill the law firm tables, but they do not seem to encourage those same young women to attend the programs. I hope that more law firms will come to understand the importance of these kinds of programs in creating value in the junior lawyers. Emphasis on developing work, the pipeline to partnership, and advancing skill sets have great benefits to law firms, and it is the junior lawyers who need these programs the most. Firms need to see the time and money spent on these programs as positive for the firm. Keep the NAWL Annual Conference in mind for next July. It is a must for me, and I know you would enjoy it, too. Approach your law firm managers and make a case for sending you to the programs, and invest your own time in attending. Remember our discussions about the value of non-billable time. You will learn so much in these programs, and they are well worth your time. Stay tuned to www.nawl.org for more information. Know the great men [and women] of your age. There are many great men and women of our age, and we cannot let the events of last week in Aurora, Colorado overshadow that greatness. We must remain positive and focused on the greatness and the possibilities of greatness for all of us. The New Book Is OUT!!!!!!!!!! TODAY IS THE DAY! 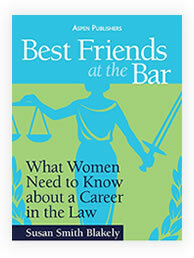 The new Best Friends at the Bar book is being released by Wolters Kluwer Law & Business today. 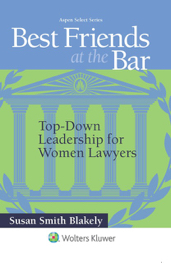 Best Friends at the Bar: The New Balance for Today’s Woman Lawyer is a book that all young women lawyers should read, whether they are currently experiencing the work/life struggle or anticipating the work/life struggle that can result from the conflict of profession, home and family. The new book digs deeper into the work/life challenges and helps women lawyers achieve balance and have successful and satisfying careers. The book also addresses transitions from one practice setting to another and includes profiles of twelve women lawyers who were successful in transitioning from law firm practices to alternative practice settings. These profiles include: The former General Counsel of the Overseas Private Investment Corporation (OPIC) and current professor at the University of Michigan Law School; the General Counsel of New York University; the Inspector General of the US Department of Education and Chair of the Recovery Accountability and Transparency Board; the Managing Partner of a large international law firm; and a leading expert on negotiations and alternate dispute resolution and media contributor. For more information or to order Best Friends at the Bar: The New Balance for Today’s Woman Lawyer, visit www.bestfriendsatthebar.com, where the book is available from the publisher, Barnesandnoble.com and Amazon.com. 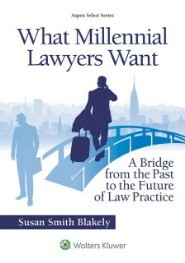 Be the first to have it and to share it with the young women lawyers in your life! Best Friends at the Bar is growing, and the message is catching on. If you have a personal definition of success as a woman lawyer that meets the needs of your personal life, you can have it all. You may not be able to “have it all” at all times in your life, but you can have some of it all of the time and all of it some of the time. That will be the true balance that is achievable and will lead to great professional and personal satisfaction. You do not have to be a partner in a law firm to have a successful and satisfying professional life. Anticipate your needs, make choices and a plan that meets those needs, and bring balance to your life. 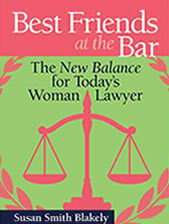 Best Friends at the Bar: The New Balance for Today’s Woman Lawyer will help you to find that balance and make is sustainable. Thanks to all of my supporters for staying true to the Best Friends at the Bar project and helping to make this new book a reality. It has been gratifying to see the project grow and to experience the positive effect it is having on so many young women lawyers. We are not finished. There is still much work to be done, and your support and enthusiasm encourages me each and every day. Be a friend of Best Friends at the Bar and help spread the word about the books and the services. Make new friends for the project and help reverse the low retention rates for women lawyers and retain talent for the benefit of the profession. You will be glad you did!